Balance of Nature Review: What's in It, Does It Work & Is It Worth the Price? Balance of Nature Review — Does It Work and Is It Worth the Cost? In the detailed reviews of Balance of Nature supplements ahead, I’ll cover the company’s two nutritional products – ‘Fruits and Veggies’ and ‘Fiber and Spice’. You’ll learn just what’s in them, how much they cost and whether they are worth it, where to buy them, potential side effects, and what I like and what I don’t like about these whole fruit and vegetable capsules and powdered fiber supplement. Also ahead is Balance of Nature company information, details on customer reviews and complaints, if there’s a free trial and whether their products are a scam. Finally, at the end of this article, a comparison of Texas Superfood vs Balance of Nature Fruits and Veggies and which is the best value. What is Balance of Nature? Is Fiber and Spice Worth the Price? Complaints and Is Balance of Nature a Hoax? Where to Buy Balance of Nature? 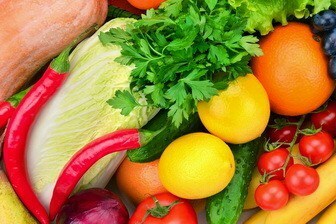 With the hectic pace of modern life, many people find it difficult to get enough healthy fruit and particularly vegetables into their diet. A significant number of us also lack adequate dietary fiber and experience digestive problems like constipation. Balance of Nature is a USA supplement company that produces, markets and sells high quality nutritional products aimed at addressing these health issues. The business founder and principal is Dr. Douglas Howard who, according to Balance of Nature’s website, is ‘an American physician, medical researcher, and international lecturer’ who ‘specializes in phytonutrition’. The company is listed on Better Business Bureau as founded in 2002 and currently based in Las Vegas, Nevada. Their website lists a phone number and email but not an address for their headquarters or a postage address for returns. There are two main products in the Balance of Nature supplement range – ‘Fruits and Veggies’ and ‘Fiber and Spice’. You can also buy these two combined in what the company calls their ‘Whole Food System’. 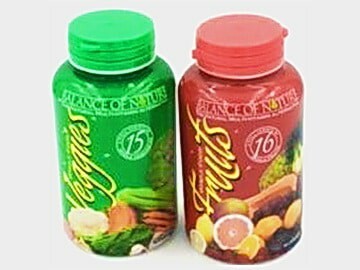 Fruits and Veggies is actually these two separate containers of 90 capsules each but they are only sold together. While the Fiber and Spice supplement is one 17.6 oz tub. 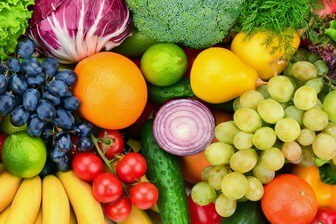 Let’s have a look at the more promising Fruit and Veggies product first and see whether Balance of Nature is any good. The ‘Fruits’ whole food capsules contain: aloe vera, apple, banana, blueberry, cranberry, cherry, grape, grapefruit, lemon, mango, orange, pineapple, papaya, raspberry, strawberry and tomato. The ‘Veggies’ product has: broccoli, carrot, cauliflower, cabbage, cayenne pepper, celery, garlic, kale, onion, shiitake mushroom, spinach, soybean, wheatgrass, yam and zucchini. The ingredients in both Fruits and Veggies are listed in alphabetical order. This isn’t helpful for this review of Balance of Nature supplements as it doesn’t give a general idea of which vegetables or fruits are the most prevalent in the formulas. Most whole fruit and vegetable pills and powders have a proprietary blend of ingredients, rather than listing specific amounts. However, the biggest by weight are usually listed first. By listing ingredients alphabetically, Balance of Nature is ignoring this convention and asking you to trust that they haven’t bulked up on cheaper ingredients, while adding much smaller amounts of the more nutritious ones just so they can be listed on the label. Starting with the ‘Fruits’ product, antioxidant rich blueberry, cherry, cranberry, lemon, papaya, pineapple, raspberry and particularly aloe vera are all highly beneficial ingredients. However, apple, banana, orange and tomatoes seem unnecessary cheaper additions as whole foods in this formula. Concentrated apple flavonoids or lycopene from tomato would have been a different story. But the small amounts of these common powdered fruits would not make much difference to all but the most nutrient deficient customer. Also, when you compare the variety of fruits and berries in Texas Superfood to Balance of Nature side by side the later starts to look quite limited in their formulation. More isn’t always better but there are far more high antioxidant additions in Texas Superfood’s supplements. Moving on to the ‘Veggies’ whole food capsules, most of these ingredients are high in nutrition with one glaring exception. I particularly liked the shiitake mushroom, wheatgrass, garlic, kale, cayenne pepper and broccoli in these capsules. That said, what on earth was Dr. Howard thinking including soybean in the Veggies formula? Soybean is an estrogenic ingredient with many health issues. It is relatively low in vitamins and antioxidants, contains problematic substances like phytic acid, causes allergies for some people and is in a myriad of processed foods in American supermarkets already. There is barely anyone in the USA that I can think of that would benefit from more soybean in their diet. It’s likely that this is a quite small proportion of the Veggies formula from Balance of Nature, but it is still a very strange addition when most whole food supplements go out of their way to list themselves as soy free. If you buy the ‘Whole Food System’ from this company you also get the ‘Fiber and Spice’ powder, which seems largely aimed at preventing constipation. Let’s have a look at what’s in it. This digestive supplement contains: psyllium husks, flax seed, apple and a proprietary blend of 12 whole spices. These are: allspice, cinnamon, clove, coriander, cumin, cardamom, fennel seed, fenugreek, ginger, mustard, nutmeg and turmeric. Psyllium husks-based fiber products can be effective at relieving constipation and cleaning your colon, though I find it difficult to see how Balance of Nature Fiber and Spice could be worth the retail price of $69.95. Both psyllium husks and flax seeds are inexpensive ingredients, even when organic, and you can buy a significantly superior product formulated by a doctor here on Amazon for far less. Alternatively, if you really want to save money, just get regular psyllium husks in a similar size for a fraction of the price and use them as directed. Possibly, if there are high amounts of organic cinnamon, fennel seeds, fenugreek, ginger and turmeric in particular in this fiber blend then it could be more valuable to a customer. Though any nutritional authority who knew their spices should list Ceylon cinnamon and high curcumin turmeric at a minimum on their product label. That’s if these higher-quality ingredients are being used rather than cheaper common alternatives. Once again, without without proper labelling of the ingredients, potential customers are being asked to trust Doctor Howard and the Balance of Nature company, without a great deal of supplement information or proof of what’s actually in the product they’re paying for. The Fruits and Veggies product is in capsule form and the recommended serving is 3 Fruit and 3 Veggie capsules taken daily. At that dose it will last for 30 days. There is no advice as to when to take these supplements but it’s generally understood that taking them with a meal with healthy fats in it can improve absorption. Divided doses are also better from a health perspective. The Fiber and Spice powder has a suggested dosage of 2 heaped tablespoons twice daily morning and night for a 30 day supply. This is quite a high amount, especially to start off with. Many health authorities recommend starting with just 1 teaspoon of psyllium husks and working your tolerance level up to 1 tablespoon several times a day to avoid side effects. Additionally, while the product label doesn’t show this, it’s best to take psyllium husk based constipation remedies on an empty stomach and importantly well away from medications. There are no commonly reported side effects of Balance of Nature products that I could find online, though I’ve listed a few potential precautions and warnings based on the ingredients. However, since the company does not sell on Amazon – usually a good source of reviews, complaints and negative effects – it may be the case that there are simply few places for customers to express problems with these formulas. People with a soy allergy should definitely avoid the Veggies whole food supplement as it lists soybean as an ingredient. I could also see bad breath and body odor as possible negative effects with the garlic, onions and cruciferous vegetables in the formula. Individuals with a rare latex allergy should avoid the Fruits product due to the pineapple and papaya ingredients. The psyllium husks in Fiber and Spice can often cause side effects and digestive problems like bloating and gas, especially when you first take it. Starting out with a low dose and building up your tolerance is recommended. The company could benefit their customers by listing this on the product label. All ingredients in the Balance of Nature range of products are vegan and the Fruits and Veggies supplements use vegetarian capsules. The labels on the bottles of both Fruits and Veggies state that the product is ‘powdered by an advanced vacuum-cold process to stabilize the maximum nutrient content’. The website also states that they use a special freeze-drying process called flash drying that Dr. Howard helped to develop himself. Additionally, they state that their ingredients and never exposed to heat or air drying. Using this kind of flash drying processing should ensure that the fruit and veg in their formulas retain the vast majority of their original vitamin and antioxidant content. Balance of Nature say on the website that all their produce is grown without chemicals, is GMO free and picked at the peak of ripeness. They also state that the dried produce powder is sent to an independent laboratory where it is tested for bacteria, pesticides, heavy metals and nutritional content. Even if Balance of Nature’s ingredients are of the highest quality and nutrient rich they are still very expensive at $89.95 for the Fruits and Veggies product, especially considering you only get 30 servings. Even more so, from a cost of ingredients perspective, for the Fiber and Spice at $69. 95, which is predominantly inexpensive psyllium husks. Though free delivery within the United States does bring down the cost a bit. You can also get $20 off either of these products by becoming a ‘Preferred Customer’ for a one-time fee of $24.95. This does include ‘personal health coaching to ensure success’ they say, but be aware it also seems to involve ongoing monthly deliveries which some customers complain is difficult to cancel. Even if you did want regular monthly deliveries from Balance of Nature, this is still a high price point for the ingredients listed in these products. Based on my knowledge of the powdered fruit and vegetable supplements market, I don’t personally see them as good value versus competitors like Texas Superfood or Patriot Power Greens. Taking the Fruits and Veggies as an example, at a retail price of $89.95 for twin 90 capsule products, you get 30 servings of 3 capsules from each. That’s $2.99 per daily dose. Compare the price with these superior Texas Superfood 180 capsules on Amazon, and that’s with a similar philosophy on ingredient quality and a much broader range of fruit, vegetables and other nutrient rich additions. 2. Balance of Nature Vitamins and Minerals? With high vitamin C ingredients like lemon, grapefruit, pineapple and papaya, along with many pro-vitamin A containing foods in the blend, you would think these vitamins would be worth listing at a minimum. Likewise mineral-rich ingredients like wheatgrass, spinach, broccoli and carrot should have provided enough minerals to proudly advertise on product packaging. Yet no mention of the the vitamin and mineral content from the company anywhere I can find on their website. 3. Why Capsules Rather Than Powder? It’s true that some people prefer capsules as they are easy to swallow. But it’s also a fact that you rarely get as much ‘bang for your buck’ with nutritional products sold as capsules versus powders. The company says on their website that ‘some people chew the Fruit capsules as a treat’ and that the Veggies capsules ‘can be opened and are delicious spread over a salad’. If their product really taste so good, why didn’t Balance of Nature decide to produce a combined raw fruit and vegetable powder like the vast majority of their competitors? The savings they could’ve made on encapsulation and less packaging could have been passed on in a lower price point for their customers. Balance of Nature say their product goes ‘beyond the USDA organic’ seal and that they choose not to use this seal on their labels because it ‘does not approach their philosophies and standards for organic’. Perhaps Dr. Howard is right on the deficiencies of the USDA organic standard, but at a bare minimum it does at least show a higher quality of produce to conventionally grown crops. It doesn’t really help the consumer, looking at a whole fruit and vegetables supplement to buy, to make no mention of organic on the label. I had to look quite hard to find this ‘organic but not organic labeling’ information buried in a difficult to find article on their website. Could the extra cost of USDA organic certification have been just as much of a factor as any ‘philosophy’? I’ve stated my concern with the inclusion of soybean as an ingredient in Balance of Nature’s Veggies supplement earlier. Digging deeper into the company website, they defend this inclusion by stating that ‘cultures that have whole soy in their food… especially fermented, have some of the lowest cancer and lifestyle diseases’. It’s mentioned in passing in this statement, but fermentation of soy products is key to their health benefits and their labeling does not state fermented soybean. The very Asian cultures the company is citing is having some of the lowest incidences of cancer, like Japan, largely consume soy only in fermented form. Any studies linking soybean to lower cancer rates usually involve consuming natto, miso and other fermented soy products – never raw soybean, which is not part of the standard Japanese diet. Since the company doesn’t sell their supplements on Amazon or any other large online retailer the only place to see customer feedback is on Balance of Nature product pages – hardly an impartial resource. There are 8 reviews for Fruits and Veggies, all 5 star and all with the date September 14, 2017. I’ll leave readers to form their own opinion of this. There are no reviewers for the Fiber and Spice supplement, though psyllium husk products can cause side effects so I would have expected more feedback and even complaints here. If this company sends their products to an independent laboratory for nutritional testing as they’ve stated, then they should have detailed information they could list on their product labels. Instead, Balance of Nature nutrition facts are very limited if not non-existent. Not even the carbohydrate, sugars, protein, fat, mineral or vitamin content of Fruits and Veggies is listed. For the Fiber and Spice product the label shows carbs, dietary fiber and omega fatty acids only. 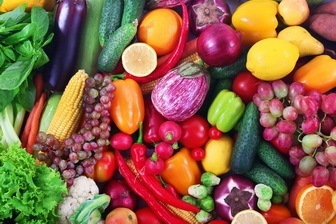 Potential customers are essentially being asked to trust the good doctor that the Fruits and Veggies product contains usable amounts of the more expensive high nutrient ingredients, rather than containing predominantly the cheaper common vegetables and fruits listed. Expanding on this point, the company website, while initially appealing, is actually quite light on information. Many people nowadays are more aware of the health benefits of specific fruit and veggies and would appreciate much more detail on a product they are being asked to pay top dollar for. Delving deeper into the research for this review of Balance of Nature, I discovered some concerns about the company and even people stating that their products were a ‘scam’ or ‘hoax’. Several complaints on Better Business Bureau detailed customers receiving recurring orders, even though they believed they had only made a one-off single order. It was stated several times from different reviewers on the BBB site that when they contacted the company they were told they were not allowed to return the unopened product. This is poor customer service and ultimately detrimental to a business’s reputation. Overall, Balance of Nature had a Better Business Bureau rating of B- due to 16 complaints against the company. Additionally, there were 12 customer reviews, with two positive and 10 negative reviews in total. This isn’t as low as the supplement giant It Works Greens! but still much lower than the A rating for Patriot Power Greens on Better Business Bureau. Furthermore, the National Advertising Division in the USA has referred Balance of Nature Inc to the FTC for claims made about their dietary supplements on November 6th 2017. According to the NDA, the company ‘failed to file a substantive written response to provide any evidence to substantiate the challenged claims’. Possibly Dr. Howard is being targeted by authorities who don’t like the idea of a doctor promoting nutritional supplements rather than pharmaceutical drugs. Regardless, the poor customer service detailed in the complaints against this supplement company seem quite damaging to their reputation. Whenever a reasonably high number of people are searching online for terms like ‘Balance of Nature scam’ and calling your products a hoax it would be worth taking a good hard look at the business practices of your company. This is an especially important point when Balance of Nature appears to be asking customers to trust in the potential health benefits of their products with little proof beyond what they have written on their site. The company’s website could also use some serious work with many of the links broken or redirecting back to the homepage and overall providing limited information on the business. A returns policy, more details on the ‘Prefered Customer’ subscription model and a receiving postal address in particular should be easily accessible on any website selling supplements directly to the public. You cannot purchase Balance of Nature products on Amazon or other large online retailers. They are also not available at Walmart, Whole Foods or in other health food stores. The only way to buy Fruit and Veggies, Fiber and Spice or their combo Whole Food System is here on their website at balanceofnature.com. If you still decide you want to get Balance of Nature supplements, despite the concerns detailed in this review, then make sure you check carefully whether you are signing up as a ‘Preferred Customer’ and liable to be charged for ongoing monthly deliveries. This seems to be the biggest complaint with the company and most likely reason behind people questioning whether their products are a scam or hoax. Finally, before buying Balance of Nature Whole Food System or Fruit and Veggies I’d highly recommend comparing it with the similar but better Texas Superfood capsules which you can find on Amazon here. If you are considering the Fiber and Spice psyllium husk supplement you could also save a lot of money by using this far more effective and better value product, also on Amazon, instead. There seems to have previously been a free trial of Balance of Nature and many people still search for this online. At the time of writing this review I couldn’t find any links on the company’s website for a free trial so it appears this is no longer available. Using Internet Archive you can find a page with a ‘Hear About Us on TV?’ heading and the option to enter a promotional code to receive your special offer. Like much of the company’s website, this page is no longer working and redirects back to the homepage. When you do a proper comparison of Balance of Nature Fruits and Veggies with Texas Superfood the latter looks both the superior product and the better value. Texas Superfood is made from a combination of 50+ raw, vine ripened and high nutrition vegetables and fruit, the majority of which are USDA organic certified. The company states that this supplement is vegan, gluten-free, dairy free and, unlike the Veggies product, soy free. According to their website there is also a 30 day money back guarantee. It’s not just the wider variety of fruits and vegetables in Texas Superfood capsules that compares well to Balance of Nature. It’s the specific ingredients as well. In the vegetable section: artichoke powder, beetroot, broccoli sprouts, fenugreek extract, holy basil, kale, maca powder, parsley and turmeric are all nutritional standouts. From the fruit ingredient list: acai, blueberry, black walnut leaf, goji berry, hawthorn berry, monk fruit, noni powder, organic black seed powder, pomegranate juice and pumpkin seeds are all antioxidant rich inclusions. Unlike its Balance of Nature competitor, Texas Superfood also includes an enzyme blend for better digestion, lactobacillus probiotics for gut health and nutritional algae like chlorella and spirulina. You can find Texas Superfood on Amazon here and see more customer reviews and answered questions on this better alternative to Balance of Nature. Everything written in this article is my personal opinion but I believe I’ve raised valid questions on this company and its products. Nothing should be taken as medical advice or personal criticism of any individual, only my perspective on the research I conducted. I’m happy to read and respond to different perspectives and feedback in the comments below. At the start of writing this review of Balance of Nature supplements I liked their focus on high-quality ingredients and careful processing of vine ripened fruit and vegetables. Unfortunately, with more detailed examination, I personally don’t think the ingredients themselves can justify the high price this company is asking for their nutritional supplements. This is especially the case regarding the Fiber and Spice product, also sold in the Whole Food System, since the primary ingredient, psyllium husks, is quite inexpensive. 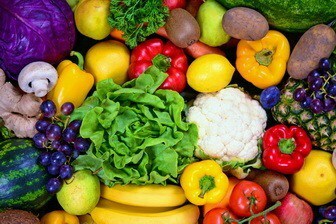 The Fruits and Veggies product by Dr. Howard looks quite healthy, with the exception of the soybean addition, but there are so many better concentrated fruit and vegetable powder products out there now. From the knowledge I’ve gained from over a decade researching and writing about superfoods, I don’t think that Balance of Nature, with their expensive cost per serving, stands up well to their competition in an objective comparison. The only reason I can see to buy this product is if you believe in the superiority of the produce selected for the formulas and the processing methods used during production. Otherwise, it’s difficult to see why you wouldn’t choose the much broader range of nutrition in Texas Superfood, reviewed in detail here, over Balance of Nature as your whole fruit and veggies supplement. Uses vine ripened fruit and vegetables. Careful ingredient processing using flash drying for retaining maximum nutritional content. Poor product information and labelling. Soybean used in Veggies product. Expensive price for the average ingredient list. I took Balance of Nature for a full month and took a blood test my B12 was always 360 jumped to 1170 and my folic acid was17 and it was always 8 could this be due to balance of nature? If you didn’t take supplemental B vitamins at this time and your diet was similar then the nutrition in Balance of Nature would be the most likely explanation.